Today I was off for a meeting in Nijmegen and knew I would be a bit early, so I put my bike in the back of the car for a 1,5 hour ride in the hills around Beek and Berg en Dal. The total distance was only 20 km but the weather was great and I must have spent over half of the ride climbing some hill or another. 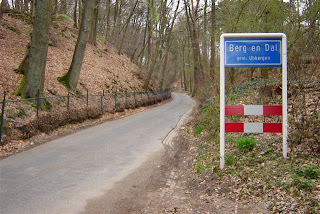 I was able to loop around through Ubbergen, back to Beek and then climb up the steep hills to Berg en Dal. I made this loop 5 times to climb the Oude Holleweg (3x) and the Van Randwijckweg (2x). This was all good for a serious max heart rate of 198, tired legs, and 1350 calories burned. 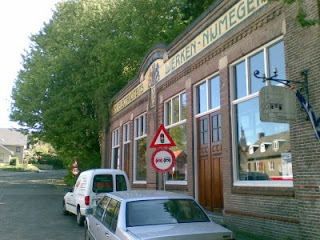 The top left picture is of the Oude Holleweg and the bottom right picture is of the old station house at the bottom of the Van Randwijckweg climb. There is a large amount of road construction going on so the roads were dirty and partially blocked which means you have to pay a bit more attention before the climbs start (in Beek and on the Van Randwijckweg). The Oude Holleweg is just a very steep and narrow climb that you feel get much steeper at the end. By the third time I did it I was pretty much maxing out my heart rate as I stood up on the pedals. The Van Randwijckweg climb was a much better road, more easy going until the sharp corner that either doubles back to the left or goes down to the right. At that point you hit the bricked street and it gets very steep again. Really a fun climb to do as you can take the first part in the medium gears and don't have to drop down to the climbing gears until you see the bricked portion of the road aproaching (this is a good tip if you are a recreational rider like me).